The court granted defendant's motion for judgment on the pleadings that plaintiff's real-time auction patent was invalid for lack of patentable subject matter and found the claims did not contain an inventive concept. "The patent itself describes implementing an existing abstract idea — an auction — refined for implementation on the Internet. Two-modes does not change this. . . . Likewise, a partial update of the web page with only minimal information is also just Internet implementation of a 'real live auction'. . . . Individually and collectively these variations do not make the abstract idea described patent eligible. . . . [Plaintiff] claims its approach to an online auction minimizes server use. . . . [T]he [patent] does not identify server bandwidth as a problem to be solved by the Patent. However, even if it were, it is only a incidental benefit to generic implementation of the [patent] claims." The number of patent lawsuits being filed in 2015 so far is higher than that seen in 2014. This has been driven by a surge in software patent cases, which in February had the largest number of lawsuits filed since April last year. Managing Intellectual Property has published a special report analyzing this increase in new case filings based on Docket Navigator data. Complimentary access has been made available as a benefit to Docket Navigator subscribers. Click here to access the report. The court granted in part defendant's motion for attorneys' fees under its inherent power because plaintiff's litigation was in bad faith and rejected plaintiff's argument that defense counsel frontloaded their work. "Defendant entered into a fixed-fee arrangement under which it paid counsel a set amount each month, irrespective of the amount of work performed during that period. Plaintiff argues that the arrangement incentivized defense counsel to perform work earlier than necessary so that counsel 'did not substantially exceed the cap on the payments it was to receive when the case started moving.'. . . [T]he Court does not find that defense counsel performed unnecessary, frontloaded work. . . . [R]esponsible attorneys would not stand around and wait for months once their client has been accused of infringement and then rush to perform all their work once they get more specific information. It is reasonable to begin investigating and preparing a defense once an infringement suit has been brought." Following jurisdictional discovery, the court denied defendant's motion to dismiss plaintiff's declaratory relief action for lack of personal jurisdiction. "[Defendant's] receipt of service of the amended complaint while he was attending the SHOT Show in Las Vegas establishes personal jurisdiction. [Defendant] was physically present in Nevada and he was personally served. Due process in this case requires nothing more. . . . [E]ven if [defendant] had not been personally served with the amended complaint in Las Vegas, the record developed through discovery supports a finding of personal jurisdiction here. . . . [Defendant] routinely used the SHOT Show as a venue to identify potential infringers and that he, through counsel, made efforts to discourage potential infringers from displaying their products at the SHOT Show by sending cease-and-desist letters only days before the event. . . . In such a situation, it should come as little surprise to the patentee that he is required to defend himself against a declaratory judgment action for noninfringement in the forum he repeatedly utilized to identify products potentially infringing his patent." The court denied defendant's motion to dismiss plaintiff's "shotgun" direct infringement claim but warned of a potential exceptional case finding later. "[Plaintiff's] asserted patents are clearly complex. 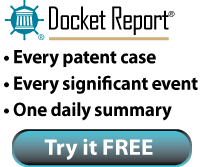 Among the six patents, there are over 900 claims, many of which [plaintiff's] counsel admits are inapplicable to [defendant's] products and services. A pleading that alleges 'one or more' of the over 900 claims in the patents-in-suit are infringed gives [defendant] and this court scant notice of what is truly alleged to be at issue in this case. Although adhering to the minimum requirements of Form 18, [plaintiff's] direct-infringement pleading is a classic example of a 'shotgun' approach to pleading, where the sheer volume of potential asserted claims and complexity of the patents are overwhelming to the parties and to the court. . . . Still, because the requirements of Form 18 have been met, the court will not at this time instruct [plaintiff] to redraft its direct-infringement allegations. . . . However, the court does remind [plaintiff] that a sprawling resource-depleting approach to this case, which ultimately proves to be unduly wasteful, may factor into a finding that this case is an 'exceptional' case that justifies fee shifting." In response to the parties' joint claim construction statement addressing twenty-three disputed terms, the court ordered the parties to "identify the ten terms the construction of which will be the most significant in the resolution of this dispute." "It is not apparent to the court why many of the terms, such as 'file,' are in dispute, let alone case or claim dispositive. . . . The purpose of requesting construction of a term is not to lard the record with potential error or to impose costs on an opponent. Given the number of terms in dispute, the court orders that the parties meet and confer in good faith, in an attempt to reduce the number of terms in need of construction and to determine those terms on which agreement can be reached. . . . The traditional primer on the general principles of Markman v. Westview Instruments, Inc., 517 U.S. 370, 116 S. Ct. 1384 (1996) and Phillips v. AWH Corp., 415 F.3d 1303 (Fed. Cir. 2005) (en banc) is not likely to be necessary or helpful." "[The petitioner] does not show that we misapplied § 325(d) in assessing whether 'the same or substantially the same prior art or arguments' were raised in the first and second petitions. . . . Our authority is grounded not only in § 325(d), but also in the broader discretion to deny a petition under § 314(a). . . . [The petitioner] argues that the Board should not have considered whether any new prior art or arguments raised in the second petition were known or available to [the petitioner] at the time of filing the first petition. . . . [The petitioner] advances a bright-line approach that would allow petitioners to file 'follow-on' second petitions in order to 'correct deficiencies noted' by the Board in decisions that deny a first petition. That bright-line approach would allow petitioners to unveil strategically their best prior art and arguments in serial petitions, using our decisions on institution as a roadmap, until a ground is advanced that results in review—a practice that would tax Board resources, and force patent owners to defend multiple attacks. We did not err by adopting a more flexible approach that assesses each case on its particular facts to achieve a result that promotes the efficient and economical use of Board and party resources, and reduces the opportunity for abuse of the administrative process." In the first few months of 2015, district courts have ruled on twelve Rule 12(b)(6) motions to dismiss and motions for judgment on the pleadings challenging the validity of patents under §101. Eight were granted, for a success rate of 67%. To view a Motion Success Report showing the outcomes of these motions since 2008, click here. The magistrate judge recommended denying defendant's motion to dismiss and rejected the argument that the validity of the asserted patient monitoring patent under §101 could be determined at the pleading stage. "While handling the issue of §101 eligibility at the pleading stage is permissible, those issues are often inextricably tied to claim construction. Thus, it seems a definitive ruling on eligibility before claim construction is only warranted in narrow circumstances, making such a ruling the exception rather than the rule. . . . The difficulty of making a substantive ruling on the validity of an issued patent in what is – in essence – a complete vacuum cannot be understated. While the claim language of some patents may be so clear that the court need only undertake a facial analysis to render it invalid at the pleading stage, that will not be the norm and is certainly not the case here." The court granted defendant's motion to dismiss for lack of patentable subject matter because plaintiff's e-commerce patents lacked an inventive concept. "[Plaintiff] argues that the 'novel combination of a buyer's participation in both an auction and a 'competitive' or 'intermediary' activity is distinct from any of the systems for conducting e-commerce,' and thus makes the subject matter patent-eligible. . . . The addition of an auction and a competitive activity to a sales transaction is nothing more than the addition of 'well-understood, routine, conventional activity.'. . . Contrary to [plaintiff's] assertion during oral argument, the Internet is not essential to perform the claimed functions. Reliance on an intermediary activity to determine price has been a practice in sale negotiations throughout history, long before the existence of the Internet or computers." The court denied without prejudice defendants' motion for judgment on the pleadings that plaintiff's data communication patents were invalid for lack of patentable subject matter because defendants failed to establish a lack of inventive concept. "[T]he patents concern software that controls the way a user modem communicates with a telephone company modem . . . The claims here 'do not merely recite the performance of some business practice known from the pre-Internet world along with the requirement to perform it on the Internet.' Instead . . . Plaintiff’s claims appear to describe a solution that is 'necessarily rooted in computer technology in order to overcome a problem specifically arising in the realm of computer networks.'. . . [T]here is no record of the technology described in the patents being well-known at the time of filing or simply involving performance of 'well-understood, routine, and conventional activities commonly used in the industry.' . . . Defendants emphasize the 'software focus' of the patents as if recent Federal Circuit cases support a rule that software is categorically patent-ineligible. The Court does not interpret the cases that way and, instead, agrees with the conclusion in [California Inst. of Tech. v. Hughes Commc’ns Inc. (C.D. Cal. Nov. 3, 2014)] that 'software must be eligible under § 101.'" The court denied counterclaim defendants' motion for attorneys' fees under 35 U.S.C. § 285 following summary judgment of invalidity because the case was not exceptional. "Ironically, this Motion may be more exceptional than what it attacks. Counterclaim Defendants primarily argue that '[counterclaim plaintiff] should have known that the [patent] is invalid,' and thus presumably should not have defended the validity of his patent or asserted counterclaims. . . . [Counterclaim plaintiff's] manner of litigating this case was not exceptionally unreasonable. It was [counterclaim defendants], not [counterclaim plaintiff], that initiated this case. . . . While true that the disputed patent claims were weak, that is, unfortunately, not exceptional. Absent a showing that something was withheld from the USPTO, a patentee should be able to rely to some degree on the USPTO’s expert views and the resulting presumption of validity." The court overruled plaintiff's objection to the magistrate judge's recommendation to award defendant attorneys' fees under 35 U.S.C. § 285 because plaintiff's claims were unsupported. "[Plaintiff] first objects to the Report and Recommendation on the grounds that 'only by exaggeration of an otherwise benign record could this case be deemed exceptional.' The Court flatly rejects [plaintiff's] nonpenitent view. . . . [Plaintiff's] argument that it retained the patents and therefore was justified in pursuing its case against [defendant] is a fallacious one. There was not one piece of evidence to support [plaintiff's] position that even if it retained the patents, [its licensee] could not make use of them in its commercialization efforts. The business deal made no sense otherwise. . . . Had [plaintiff] done any due diligence, it would have learned that no witness supported [plaintiff's] construction of the Agreement and this case [should] never have been filed." The court granted defendant's motion for summary judgment that plaintiff's wireless data transmission patent was invalid as indefinite because of the term, "substantially prevent communication interference between the first and second pairs." "It is clear that the use of the word "substantially" does not necessarily make a claim term indefinite. . . . But when a word of degree is used in a patent, the court must determine whether the patent’s specification provides a standard for measuring that degree. It is not enough to identify some standard for measuring the scope of a phrase. . . . [Defendant] correctly notes that the intrinsic evidence does not offer any objective boundaries for the term 'substantial.' The fact that the specification and prosecution history lack evidence that would inform a person skilled in the art as to how much interference prevention the patent contemplates sets it apart from patents that have overcome indefiniteness challenges to terms of degree." The court awarded defendant more than $5.3 million in attorneys' fees under 35 U.S.C. § 285 and rejected plaintiff's argument that an award could bankrupt plaintiff. "[Plaintiff], which instituted this action with an eye toward 'tak[ing] [defendant] out,' now argues, without even a wisp of irony, that the risk of bankruptcy entitles it to a reduced fee liability. . . . [Plaintiff's CEO] contends only that a fee award in excess of $4 million 'may lead customers to terminate contracts with [plaintiff].' He does not contend that it would, or even could, result in bankruptcy as [plaintiff's] opposition brief asserts. Taken together, these facts are too speculative to merit a diminution in fees. Furthermore, capping a litigant's § 285 liability at the value that it can comfortably pay comes close to effacing the statute's distinct purpose as a deterrent to frivolous litigation." The court granted defendant's motion for attorneys' fees under 35 U.S.C. § 285 following jury and bench trials because of the lack of strength of plaintiff's case and its litigation tactics. "[E]vidence at trial showed that this litigation was at least in part motivated by Plaintiff’s desire for 'payback' for Defendant’s successful competition in the marketplace. . . . [I]nformation regarding Plaintiff’s marking policies, procedures, and practices was uniquely in Plaintiff’s possession, but Plaintiff either did not adequately review this material before filing suit, or filed suit knowing that it had not complied with the marking requirement. Plaintiff compounded this by engaging in gamesmanship that made it hard to discover and prove the marking failure. . . . The substantive and procedural problems concerning the [patent-in-suit] are particularly troublesome in this case because, due to the patent’s expiration, there was no case at all on the [patent] absent compliance with the marking requirement." The court granted in part defendant's motion for attorney fees under 35 U.S.C. § 285 following a jury trial because of plaintiff's litigation misconduct after the inventor changed his testimony regarding conception at trial. "During his deposition, [the inventor] testified that he did not recognize or have any knowledge of a document and stated that he would not change his testimony at trial. However, at trial he identified the document as his conception document and stated that he was the author. [The inventor] explained that he had requested a copy of the document to look over after the deposition, at which point he recalled what it was. . . .While a change of testimony is not itself necessarily unethical or unprofessional, the failure of [plaintiff] to alert [defendant] to the change in testimony at any point in the year prior to trial is. [Plaintiff] knowingly introduced testimony that violated a witness's sworn commitment not to change his testimony at trial, understanding that [defendant] would have prepared based on misleading information. [Plaintiff] took no steps to rectify the situation despite ample time to do so. Accordingly, the testimony of [the inventor] warrants a determination of exceptional conduct." The court granted defendant's motion to dismiss plaintiff's patent misuse claim for failure to state a claim. "[C]ourts disagree on whether patent misuse can constitute a claim, not just a defense. . . . Some courts view [B. Braun Med., Inc. v. Abbott Labs., 124 F.3d 1419 (Fed. Cir. 1997)] as allowing an affirmative claim of patent misuse so long as the plaintiff does not seek damages. . . . Others read B. Braun as rejecting patent misuse as an affirmative claim regardless of whether it seeks a declaratory, injunctive, or compensatory relief. . . . [T]here is no disagreement among the courts that patent misuse doctrine cannot be asserted for monetary relief . . . as [plaintiff] seeks to do here. . . . Moreover . . . this Court concludes that patent misuse cannot be brought as a stand-alone cause of action. . . . [T]he Federal Circuit has repeatedly defined patent misuse as a defense, rather than a cause of action in its own right." Have Highmark and Octane Changed How Courts Apply § 285? Since the Supreme Court decided Highmark and Octane on April 29, 2014, U.S. district courts have ruled on seven motions to reconsider earlier rulings on motions for attorney fees under 35 U.S.C. § 285. Five were denied or recommended for denial, one was granted and one was partially granted. To view these orders, click here. To view summaries of the rulings, click “Show Annotations” at the bottom of the page. In light of Highmark Inc. v. Allcare Health Mgmt. Sys., Inc., 134 S. Ct. 1744 (2014) and Octane Fitness, LLC v. ICON Health & Fitness, Inc., 134 S. Ct. 1749 (2014), the court sua sponte reconsidered an earlier order denying defendant's motion for attorney fees under 35 U.S.C. § 285 and again determined that a fee award was not warranted because plaintiffs' claims were not baseless under the new standards. "The Court ultimately concluded that [defendant] had the better argument in its Markman ruling, but the Court only did so after fifteen pages of analysis. It is worth noting that, in its analysis of the term, the Court’s decision was based on the weight of the evidence — the Court did not find a clear and unmistakable disavowal or definition of the term in either the patent or the prosecution history. . . . [T]he Court does not consider a case 'exceptional' simply because there is dispute over the construction of patent claims and that a defendant or plaintiff’s construction proved to be incorrect — there must be more." The Board denied the petitioner's request for institution of an inter partes review of a patent related to landing and recovering a reusable launch vehicle at sea, as the challenged means-plus-function claims were not amenable to construction. "[The petitioner] contends that, although the Specification discloses that 'the routine starts with booster engine ignition' and that 'booster engine cutoff occurs at a predetermined altitude,' the Specification is otherwise silent on details about igniting, shutting off, or reigniting the engines, in terms of both structure and function. . . . Unable to identify structure in the Specification corresponding to the recited functions, [the petitioner] urges us to construe the 'means for' limitations as 'any suitable structure' that ignites, shuts off, or reignites a rocket engine. That, we cannot do. . . . Interpreting means-plus-function language to encompass any structure for performing the recited function not only violates 35 U.S.C. § 112, ¶ 6, . . . but also violates our standard of applying the 'broadest reasonable construction' to claims undergoing inter partes review. . . . A lack of sufficient disclosure of structure under 35 U.S.C. § 112, ¶ 6 renders a claim indefinite and, thus, not amenable to construction. . . . Because the challenged claims are not amenable to construction, we are unable to reach a determination on the reasonable likelihood of [the petitioner] prevailing on the prior art ground asserted in the Petition." The court granted defendant's motion to dismiss plaintiff's claims for infringement of its proposal preparation patents because the asserted patents lacked patentable subject matter. "[T]he asserted claims are directed to the abstract idea of creating a customized sales proposal for a customer. . . . [T]he Court does not hold that all claims in software-based patents are directed to an abstract idea. Indeed, the contours are often unclear between those inventions that are directed to an abstract idea and those that are not. . . . Although verbose, the claims as a whole broadly recite a simple process which, in this case, does not require the type of complex programming that confers patent eligibility. Importantly, the claims in no way 'purport to improve the functioning of the computer itself.' Likewise, the claimed invention is not 'necessarily rooted in computer technology in order to overcome a problem specifically arising in the realm of computer networks.'. . . The claims identify no inventive algorithms or otherwise creative means for generating a customized sales proposal other than an instruction that the basic process be performed using generic computer components." Traditionally, pre-trial challenges to the validity of patents were raised primarily in summary judgment motions, not in challenges to the pleadings under Rule 12(b)(6) or a motion for judgment on the pleadings. Conventional wisdom dictated that, in most situations, a court could not address validity until after discovery and claim construction. Alice is changing that for validity challenges based on §101. During the four year period from 2008 to 2011, courts ruled on only seven such motions and granted two for a success rate of 28.6%. By 2014, courts ruled on 24 such motions and granted 13, for a success rate of 54.2%. In 2015 we’ve seen rulings on 9 motions and all but two were granted, for a success rate of 77%. To view a Motion Success Report showing the success rates and outcomes of these motions since 2008, click here. Since 2008, U.S. district courts have ruled on 924 motions for attorney fees under 35 USC § 285. About 60% were denied each year, with the exception of 2013 when the denial rate increased to 67%. It appears Octane Fitness and Highmark may be changing that. Last year only 57.6% were denied and the denial rate in 2015 to date is only 48%. Click here to view a Motion Success Report showing all outcomes of motions for attorney fees since 2008. Using the filters on the left side of the page, you can modify the report to focus on a specific court or judge. You can also print the report in PDF format by clicking the printer icon. The court granted defendants' motion for attorney fees under 35 U.S.C. § 285 following summary judgment of noninfringement because plaintiff should have known its claims were meritless. "The infringement claims against [defendants] depended on a claim construction that the court clearly rejected in prior litigation on closely related patents. . . . [Plaintiff] justifies the arguments it advanced here on the wording differences, asserting that the prior construction in [the earlier case] was not 'controlling.' The prior construction was not preclusive, but it certainly was clear. . . . [Plaintiff's] arguments for a different construction in the present cases were wholly unsubstantial and without merit. . . . It was merely a vehicle to relitigate prior, clearly rejected, positions." The court partially denied Google's motion in limine to preclude references to its size, wealth, and alleged market power. "Google’s size and wealth, on their own, are not relevant to the issues to be tried. [Plaintiff] may not make general statements about Google’s financials that are unrelated to damages in this case. Google’s market power, however, is relevant to the bargaining position that the two parties would take in a hypothetical negotiation. Testimony and argument on Google’s market power is permissible to the extent that it relates to that negotiation, but is not permissible to the extent that it suggests that Google behaves as a monopoly or engages in unlawful or anticompetitive practices. Evidence and arguments about Google’s non-location-related revenues and profits, as well as the value of 'location' to Google, are similarly relevant to damages and are permissible for that purpose. With these principles in mind, the parties may raise objections to specific mentions of these issues as appropriate at trial." Since the creation of new post-grant proceedings before the Patent Trial and Appeal Board, U.S. district courts have ruled on 617 motions to stay pending inter partes review (IPR), covered business method review (CBM), and post-grant review (PGR). Most of those rulings either granted or denied a stay. However, in 27 rulings, courts granted the stay upon certain conditions, the most common of which was defendants’ agreement to 35 USC § 315(e) estoppel. In some cases, the stipulated estoppel was weaker than estoppel under § 315(e). In other cases, stay was conditioned on the PTAB reaching certain determinations that might impact the litigation. To view all orders granting stays upon certain conditions, click here. The court conditioned a stay pending inter partes review on defendants' stipulation to be bound by estoppel even if petitioners withdrew but the PTAB still issued a final written decision. "The purpose of the stipulation is to provide defendants with a stay if they would, in substance, be treated as if they were subject to the estoppel pursuant to 35 U.S.C. § 315(e). That is, as if they were a petitioner, or 'the real party in interest or privy of the petitioner.' . . . An IPR petitioner who withdrew before decision – perhaps because it perceived that it was not likely to receive a favorable PTAB decision – would not escape the estoppel consequences. . . . I will not permit the defendants to avoid estoppel if the IPR petitioners decide to withdraw and the PTAB thereafter issues a 'final written decision.'"